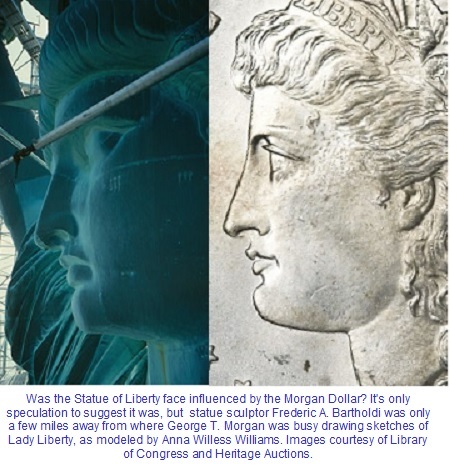 Was the Statue of Liberty Face Influenced by the Morgan Dollar? Was the Statue of Liberty Face Influenced by the Morgan Silver Dollar? Who was the woman depicted on the Statue of Liberty? As we all remember from our school days, the statue's designer, French sculptor Frederic A. Bartholdi, patterned her after Libertas, the Roman embodiment of freedom. But that's really not the answer I'm looking for. Rather, whose face is on the Statue of Liberty? Did someone model for Bartholdi, or otherwise serve as the inspiration for the strong countenance greeting millions of newcomers entering New York Harbor? One theory has it that it was Bartholdi's mother who modeled as Libertas, but this has been largely dismissed by scholars as pure fiction. I spent some time digging, but found nothing to reveal the human identity of Libertas, if any. This is not to say no conclusive evidence exists, but for all I know, it may repose out of reach in the bowels of a centuries-old Paris library in un-digitized format. Until reliable information surfaces, I and many others are left to speculate on Libertas' facial origin. I have long opined that the Statue of Liberty woman and the Lady Liberty adorning George T. Morgan's silver dollar could have been the same person. Has anyone else ever noticed the facial similarities? Did one artisan influence the other? The time and space continuum of both major players, Frederic A. Bartholdi and George T. Morgan, align perfectly to at least make this a possibility. Certainly not compelling enough to re-write the history books, but it makes for fun speculation. Both men were in Philadelphia in November 1876. Bartholdi attended the Centennial International Exhibition as a member of the official French delegation. 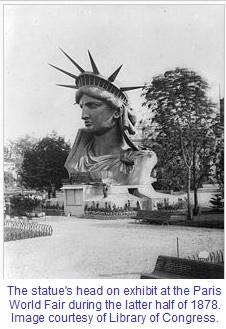 One of Bartholdi's objectives was to promote the Statue of Liberty project. 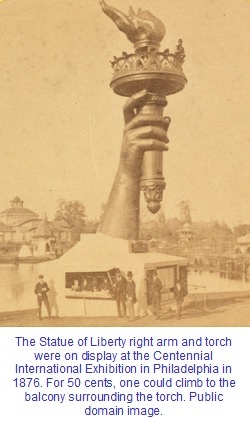 The statue's right arm and torch (little else, if anything, had been built yet) were erected and drew major attention from fairgoers. For 50 cents, visitors could climb to the top of the 30 foot arm and stand on the balcony surrounding the torch. Money raised was used to fund the statue's pedestal eventual construction on Bedloe's Island in New York Harbor. Morgan arrived in the United States from England in October 1876, at the urging of Mint Director Henry R. Linderman, and went to work right away on designing new silver coinage. The following month, November, Morgan and artist Thomas Eakins convinced a reluctant young Philadelphia woman, Anna Willess Williams, to sit as a potential model for the Lady Liberty obverse. Morgan stated Miss Williams' profile was the finest personification of liberty he had seen on either side of the Atlantic, describing her as being fair in complexion, “with blue eyes and a Grecian nose,” and hair that was “almost her crowning glory; golden color, abundant, and light of texture,” and displayed in a tasteful classical style. Williams sat for five modeling sessions during November 1876, all in Philadelphia. So while it is factual that both Bartholdi and Morgan were in Philadelphia during November 1876, I have not been able to ascertain if they crossed paths, so what follows is merely conjecture. 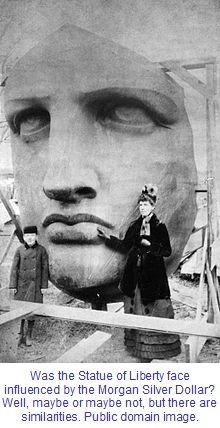 Nevertheless, it is not a far fetched notion that Morgan was attracted to the Centennial International Exhibition and could've easily met Bartholdi at the Statue of Liberty arm display. As fellow artisans, perhaps they discussed their ongoing projects and discovered they shared the goal of finding a human characterization of liberty, at which point it is possible Morgan confided he had found such a person, and invited Bartholdi to attend the next modeling session with Williams. In both images, the hairline, eyes, brow, jaw, thick lower lip, nose, and cheek could've been patterned after the same person. To be sure, there are some dissimilarities (nostrils and chin), but those could be explained away due to the inherent challenges of manufacturing a colossal sculpture. The close up photo above of the statue's face was taken in 1984, as work began on a major restoration. It is one of many fascinating photos published by the Library of Congress to document the 1980's restoration. The strong similarities between renditions of liberty from Bartholdi and Morgan have drawn some writers to (probably incorrectly) conclude that it is indeed the Statue of Liberty displayed on the Morgan Dollar. Do an internet search using "Statue of Liberty and George Morgan" and it won't take long to find examples. The Statue of Liberty (first) to Morgan Dollar (second) scenario seems unlikely. 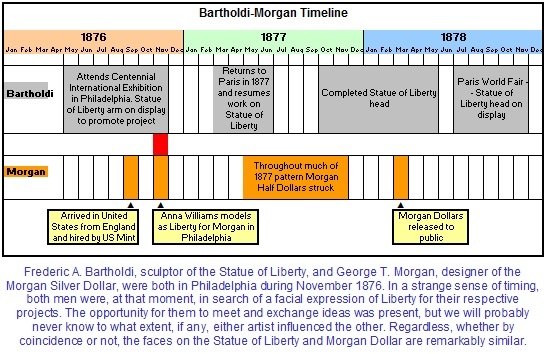 Referring back to the timeline above, by 1877 Morgan was already striking pattern half dollars featuring the nearly identical Liberty obverse used later on the new silver dollar, while Bartholdi was still in the development phase of the statue's head, so it's quite a stretch to say the Statue of Liberty face came first. If there WAS a connection, if any, the order would've almost certainly had to have been Morgan Dollar first, Statue of Liberty, second. Moving beyond November 1876, both Morgan and Bartholdi successfully completed their tasks. 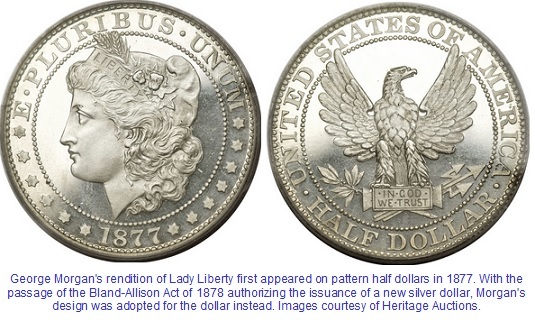 In March, 1878, a new silver dollar carrying Morgan's design was being minted by the millions. Today, the Morgan Dollar is one of the most popularly collected coins throughout the world. Bartholdi's journey was far more arduous. In mid-1878, the completed head went on display at the Paris World Fair. Construction of the statue in Paris was slowed by fundraising woes and design challenges. Bartholdi enlisted the aid of Gustave Eiffel to develop the infrastructure and flexible exoskeleton of the statue. Eiffel later went on to build the famous Parisian landmark tower bearing his name. The Statue of Liberty was fully built in its temporary Paris home and was presented to the American ambassador on July 4, 1884. Disassembly and crating of the statue in preparation of its ocean voyage to the United States began in early 1885, as the Americans were continuing construction of Liberty's pedestal on Bedloe's Island. 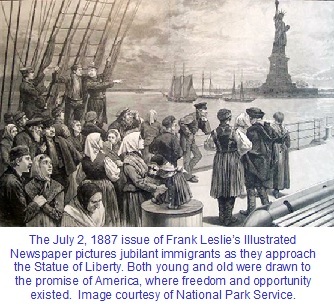 An estimated 200,000 people greeted the French ship Isere, as she sailed into New York Harbor on June 17, 1885, laden with the crated Statue of Liberty. Joseph Pulitzer of the New York World newspaper organized a fundraiser, and on August 11, 1885, announced $102,000 had been contributed by 120,000 donors, more than enough to complete construction of the pedestal. The pedestal was finally ready in April 1886, whereupon assembly of the statue began immediately. On October 28, 1886, the Statue of Liberty was dedicated. A morning parade through parts of New York City attracted a crowd of up to one million. As the parade wound past the New York Stock Exchange, ticker tape was tossed from the high rise windows, the beginning of the ticker tape tradition in the Big Apple. In the afternoon, President Grover Cleveland and a host of dignitaries made speeches at the base of the statue. Since the very first day of its dedication in New York Harbor, the Statue of Liberty became one of America's most cherished symbols, and a beacon of hope and freedom throughout the world. Millions of immigrants boarded ships bound for America, where they heard it was possible for a hard working commoner to own land and prosper, an impossibilty in many of their native countries. We can only imagine the emotional stirring felt by many of them as they were welcomed to America by Liberty's freedom torch. Well done, Frederic A. Bartholdi!